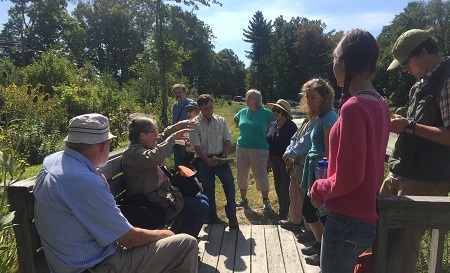 On September 17, the CT Botanical Society conducted a survey of the plants, shrubs and trees along Bull Pond. With its variety of habitats, the Bull Pond Preserve was an ideal location for a botanical survey. About a half dozen expert botanists from around the state came to conduct the survey. The Trust was impressed by their expertise and was truly honored to have such an organization dedicate its time to visit one of our properties. One of the main goals of the CT Botanical Society is to increase public knowledge of the state’s plants. This was evident, as its experts were happy to share their knowledge with about 20 local residents in attendance. Professor Sigrun Gadwa, who led an informational walk, was enthusiastically willing to answer the barrage of questions of “what’s this”, “what’s that”, “is it good for wildlife”, “and can I eat it?” She was particularly helpful to several young people, who may be on their way to a career in protecting the environment. Sigrun found a good diversity of shrubs along the east shore of the pond, including chokeberry, swamp azalea, shadbush, elderberry and several different low-growing spiraeas. She also pointed out a young pin oak, a species of tree which does not seem to be common in Harwinton. One of the sticktights, Bidens cernua, and also the blue joint grass were indicator species for unpolluted sites. Another indicator of good water quality was the fact that the shoreline marsh consisted of species like soft stem bulrush and branched bur-reed, rather than Phragmites. She found the abundance of purple New York aster along the shoreline and the ground cover of bristly dewberry and cinquefoil to be very attractive. 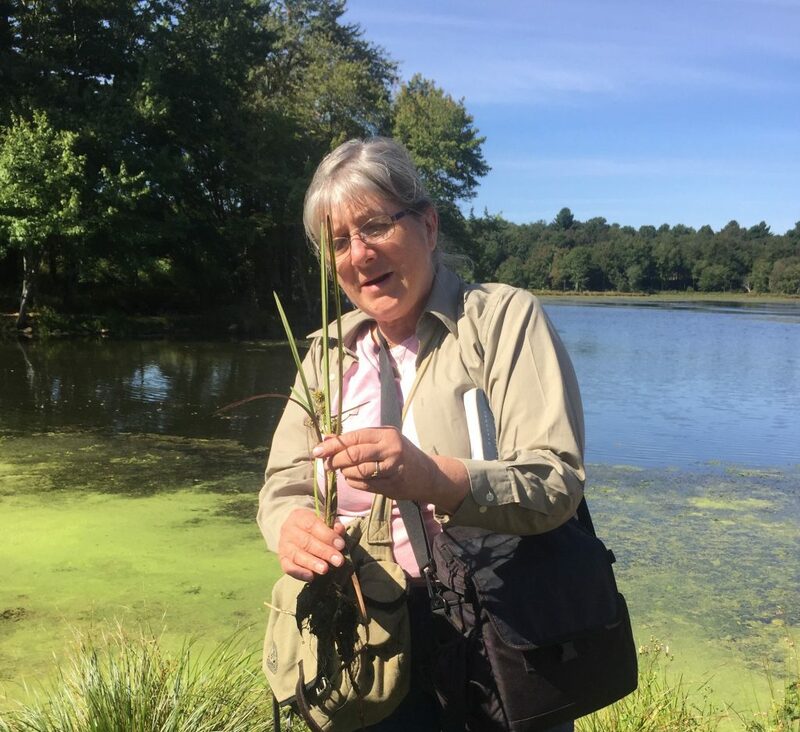 She indicated that the area around the pond, with its diversity and accessibility, was exceptionally well-suited to teaching about pond-side vegetation. Sigrun Gadwa discusses bur-reed identification. 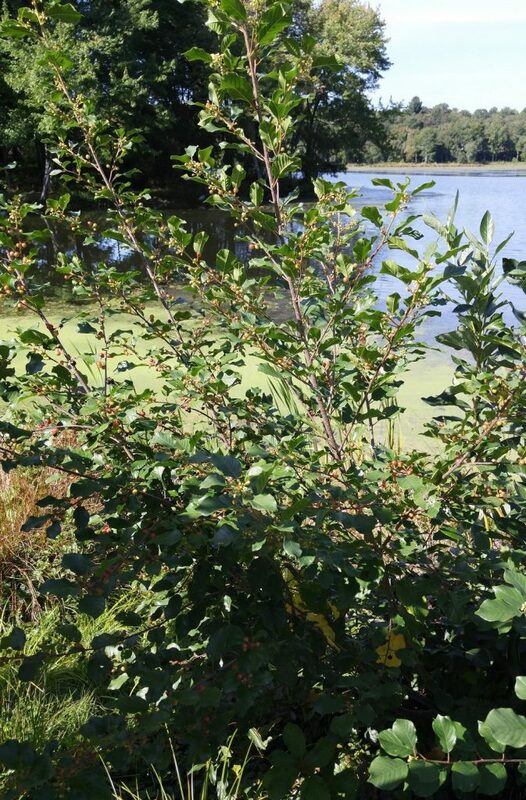 Sigrun did point out an invasive shrub, glossy buckthorn, growing sporadically along the shore of the pond. She spent considerable time explaining how the plant can rapidly spread and how to eliminate it by painting an herbicide onto cut stems. Land Trust volunteers promptly treated all the buckthorn according to her recommendations, and will check for any re-sprouting next spring. Glossy buckthorn. Pretty, but invasive. For anyone who wishes to learn more about plant identification, the CT Botanical Society maintains an outstanding website.